Login to Platform Sign up! Relying on data to make decisions takes the guesswork out of your recruitment marketing process. No surprise that for more than 50% of recruitment professionals in Europe (European Recruitment Trends 2019 survey by VONQ), collecting and measuring candidate engagement data will be a top priority in 2019. In their daily work, recruitment professionals use various technologies to become more efficient, of which the most widely used is the Applicant Tracking System (ATS), serving for managing jobs and especially helpful during the employee onboarding process. The vast majority of ATS systems has the potential to integrate with other recruitment technology. Although being the most widely used technology by recruiters, ATS systems focus mainly on optimising pipeline metrics within the system and not so much on offering data analytics on the candidate journey before they apply on a job. An ATS shows the recruiter mainly insights collected after a candidate has applied and provides limited data on the channels that a candidate has used to find the job. 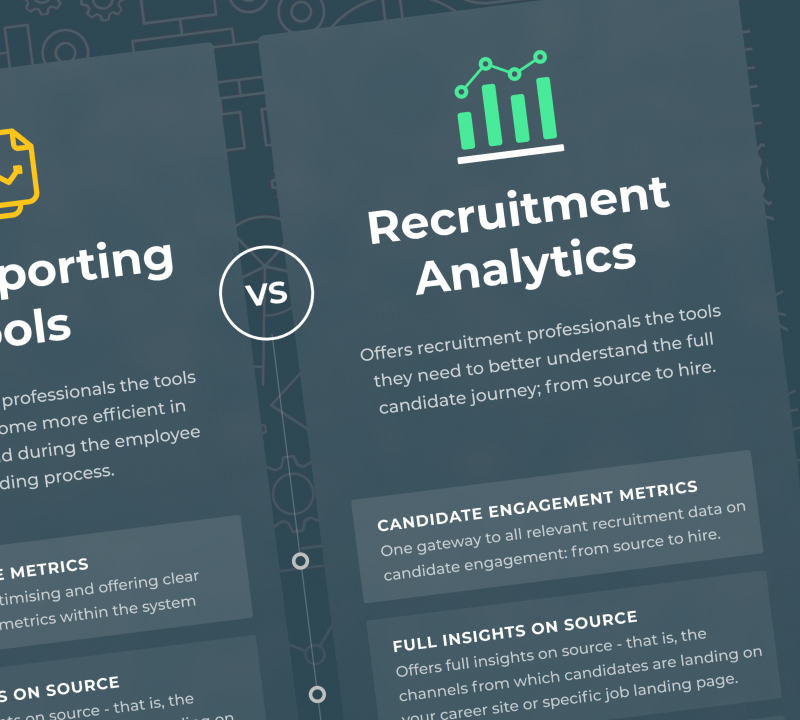 You get these full candidate journey insights with Recruitment Analytics, specifically developed for the data needs of a recruiter – one that depicts mainly candidate engagement metrics: from source to hire. I’m already getting data insights from my ATS reporting tools. How can I further benefit from Recruitment Analytics? Get Recruitment Analytics for free! Sign up to our Job Marketing Platform and get Recruitment Analytics. All that for free and only a few steps away! Subscribe today and get the 1st tip in your email box within a week! GET THE LATEST UPDATES FOR FREE! I’d like to receive occasional updates via email on the latest industry insights, e.g. weekly tips and early access to free content.